I love Elizabeth Hartmann's patterns. This is from Penguin Party. I made one of each size, and turned them into a table runner. Cute little guys! Well done!! 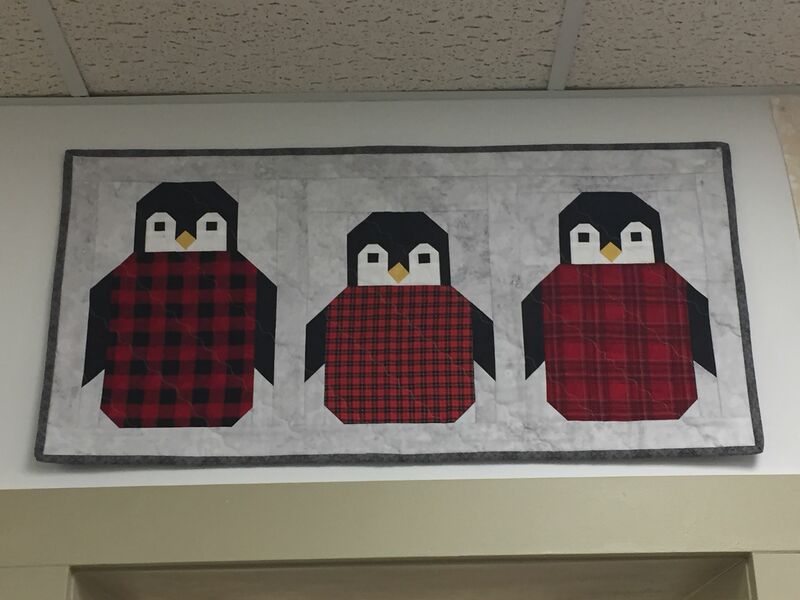 Cute penguins and love the plaids you chose...great job. Very cute and clever penguins. I think they are suitably attired for the winter season. I also like Elizabeth Hartman's critters.They are sweet and whimsical. Enjoy your table runner. Adorable! I like how the checks' sizes correspond to the size of the penguin. Ahh! It's Papa, Mama & baby penguin! That's so cute. Love the penguins in buffalo check and other red plaids. Kind of like three bears only three penguins! Cute. So cute and love the jackets you made for them. Adorable little penguins! What a fun table runner. How adorable. They remind me of the movie "Happy Feet"
They're adorable. Her animal patterns are so clearly written and have wonderful pictures of the steps. adorable! I love all of her patterns too!